Fraser-Johnston is a brand of Johnson Controls Unitary Products. A global supplier of heating, ventilating, air-conditioning and refrigeration equipment and services, Unitary Products is well known for efficient, reliable heating and cooling solutions and industry leading products. This makes Fraser-Johnston the smart choice for homeowners to make a sound investment. 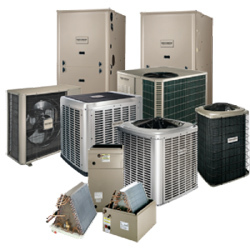 Mitsubishi Air conditioning ductless air conditioners and heat pumps are the standard in which all other units are compared to within the industry. The reliability and craftsmanship of Mitsubishi units are superb, year after year, Mitsubishi has topped customer satisfaction ratings in both performance and experience. GoDuctless.com offers straight-cooling and heat pump systems from 9,000Btu/h to 36,000Btu/h with efficiencies of up to 26 SEER! with a factory warranty of 7 years compressor and 5 year parts. LG, the world leader in ductless air products offers what no other ductless air company can provide. Aesthetically pleasing, environmentally friendly and dependable systems. If having beautiful yet practical air-conditioning is important for you, then GoDuctless.com is pleased to announce that we offer LG's full line of ductless air systems from 9,000 to 30,000 BTU. We offer single and multi-head units in both art cool™ and standard ductless air units. LG offers 5 years compressor and 2 years parts factory warranty.